Of course, once inside, Tae Ik goes through the bags and rejects everything! Man Ok wishes to know the problem now since all material is 100% natural. Tae Ik replies that’s just the basic, but the style isn’t really right. Man Ok then says that no matter what Tae Ik wears, it’s still cool and trendy since his height, looks, and body are superior. Omo. You can tell that hearing this pleases Tae Ik, but he tries to play it cool and says the problem is he can’t just wear things at random. Go Dong then yells for Tae Ik to come with him since Joon is asking to see him. Tae Ik says he’ll be right there and then turns to Man Ok and asks for the third outfit he tried on as that was the best. Man Ok looks at the clothes strewn all over…she can’t remember! Tae Ik tells her to think carefully and prepare the third one. Afterward, she should clean up all the clothes. He leaves and Man Ok screams in frustration. Three months, she only needs to hold it in and endure for three months. She then goes to pick up a very expensive watch. Normally the company wouldn’t loan out such an item, but since it’s at Joon’s request, they did give in. Man Ok must be extra careful with it and make sure to bring it back immediately after the fan meeting. Oh, you know this won’t be good. Man Ok goes through her list of required items and she has gotten them all! At home, Man Ok goes through the outfits. She places all the ones for Kang Hwi in one pile and the other pile is for “the rude jerk.” LOL. Her grandfather then calls and Man Ok quickly puts on one of the practice videos. Jang does worry because he can barely hear the shouts. Man Ok replies that is because they are new students so they are quieter. Man Ok then yells some instructions and her grandfather hangs up on her after telling her to go show and not just yell. Man Ok then gets a call from Tae Ik to bring the outfits to try on. If she doesn’t get there in half an hour he’s just going to bed. Man Ok hurries over and Kang Hwi is in a facial mask while Tae Ik is lounging around and immediately starts complaining about Man Ok’s lateness leading to their rough skin since they have an early morning. 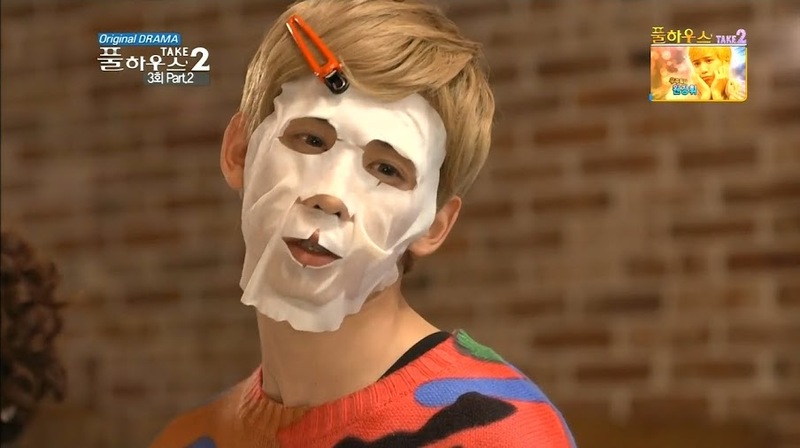 Kang Hwi points to his face and tells Tae Ik to just use a face mask like him. This causes the two boys to start bickering once more and Man Ok quickly steps between them. Tae Ik then turns to her and says its all her fault. Why did she come so late? Man Ok apologizes and says that she had to drop by the studio. Kang Hwi asks if everything is okay and Man Ok replies her grandfather calls at that hour everyday to check in on her and that she’s teaching the students well. Tae Ik then asks if she’s an idiot as you can use a connected server for your phone. Huh? Man Ok has no idea what he’s talking about. Kang Hwi then replies that you can have your home phone calls forwarded directly to your cell phone. Man Ok wonders why she didn’t know about this. Tae Ik happily says because she’s an idiot. Awww…you can kind of see them bonding now. It’s cute. Man Ok then says he could have told her earlier since she wouldn’t have to suffer so much. He asks if she’s crazy…why is it his fault? Very true. Kang Hwi then puts his arm around Man Ok’s shoulders so they can go try on clothes. Tae Ik notices and doesn’t seem to happy. 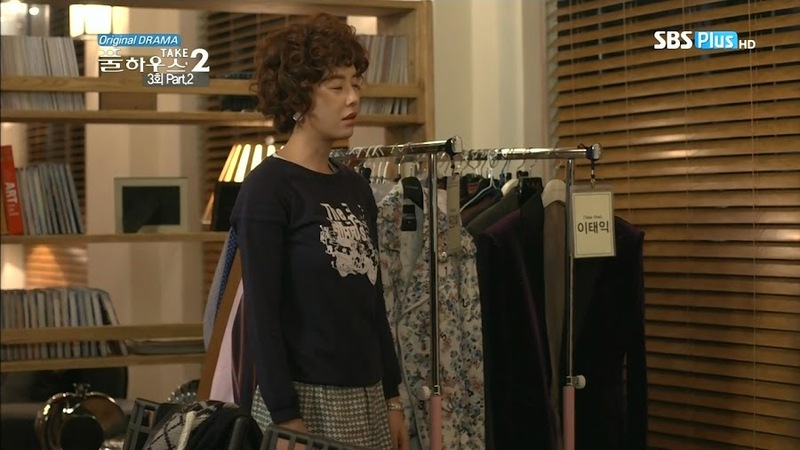 They try on clothes and Kang Hwi looks thrilled, but Tae Ik looks very unhappy.WHY are all the clothes like this? Man Ok asks what the problem is this time and Tae Ik replies the clothes are too old. Man Ok asks how that can be as they are the latest fashion trends. 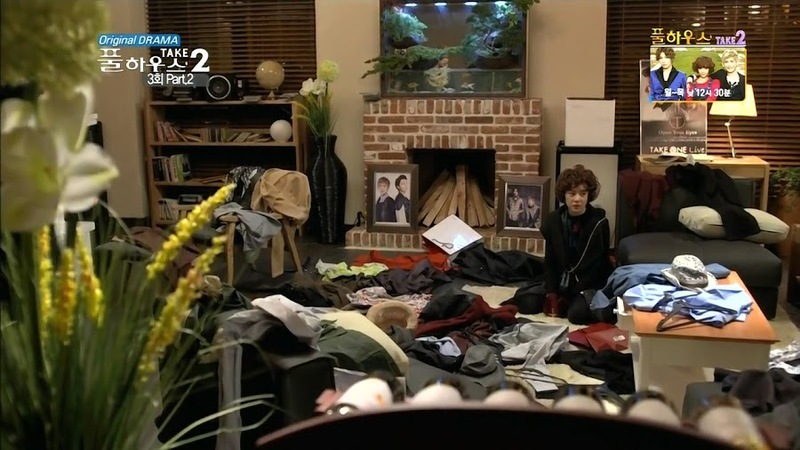 Kang Hwi then does his typical grab all clothes in sight and claim them for himself. Man Ok then takes them back and says he can’t as they are for Tae Ik. 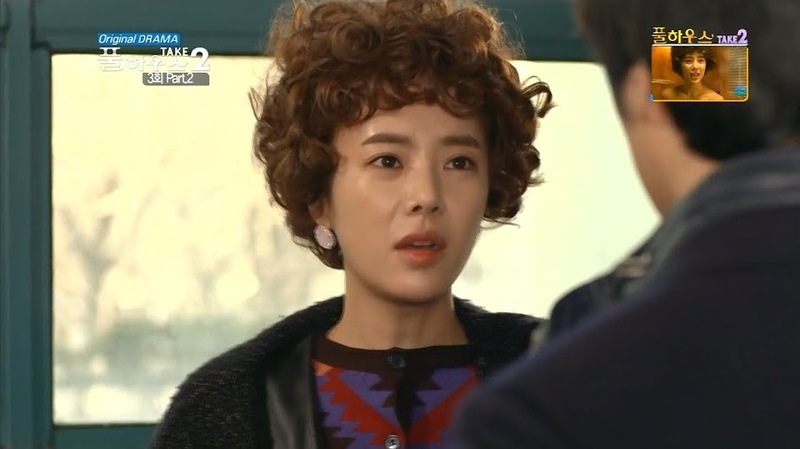 She goes over to Tae Ik and tells him he has to wear the clothes this time or he will never get another sponsorship. Tae Ik doesn’t care—he still doesn’t want to. Man Ok again demands to know why he won’t wear them as she checked to make sure the fabric is good and she fixed all the mistakes he pointed out, so what is wrong for him to be acting like a child? Man Ok then starts getting really worked up and ends her berate of Tae Ik with if he won’t wear the clothes she painstakingly chose, he can just go out naked. LMAO. This really shocked Tae Ik and makes Kang Hwi laugh and tease Tae Ik. 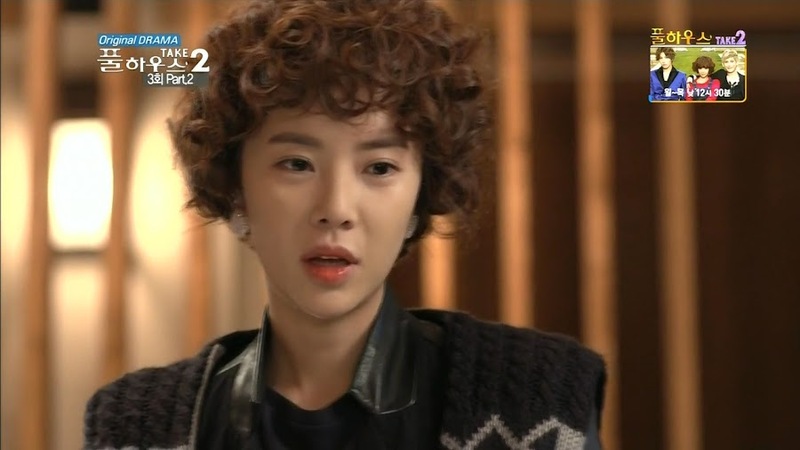 Kang Hwi then wonders if she has more clothes since Tae Ik’s are prettier. Man Ok smiles happily and says she has, of course, prepared some for him. This makes Tae Ik rather jealous as the other two bend down over a suitcase. Man Ok flips it open and Kang Hwi starts gushing about the clothes being exactly his style. Where did she get them sponsored from? Man Ok happily smiles at his praise. Back at the dojo, Man Ok lays out all the clothes in preparation for the fan meeting and looks at her watch. Wowza it’s late. You need stamina of steel in this job, too. She stretches and then looks in her purse and sees the watch box. Whoops. Meanwhile, Tae Ik is cutting up cucumbers for a face mask. He falls asleep after putting them on and is awakened by the bell. He angrily gets up and wipes the cucumbers off his face and scolds Man Ok for coming at such a late hour and waking him up. Man Ok chokes back later and asks if he was really asleep. Tae Ik replies of course he was and yawns and we get to see there are two stray cucumber slices stuck to his forehead. Man Ok apologizes, again trying to hold back her laughter. She then hands over the new sponsored watch. It would be bad if he got allergies again. Tae Ik looks at the proffered box and takes it while Man Ok just looks at him and laughs to herself. Tae Ik is in the living room as he puts on the watch. He then recalls a memory of a similar watch when he was a child. His dad takes it off his own wrist and tells his son he can keep it. Looks like Tae Ik and Man Ok actually have pretty similar pasts. She then comes in and asks if the watch is okay. It doesn’t itch does it? Tae Ik says he’s okay and Man Ok tells him its really expensive. People like them wouldn’t even see such a watch once in their lifetime, so please wear it carefully. Tae Ik then says someone like Man Ok would of course not know anything about such a high-end luxury item. This angers Man Ok and she says she just won’t do it for him. Do what? Man Ok then sets her tray down and tells him that for a cucumber mask, it’s best to use a cucumber paste. You mix in flour and honey and it doesn’t even drip. She then tells him to go lie down. Tae Ik demands to know who said he does something like that. Man Ok points at his face. What? She then pats her own forehead. 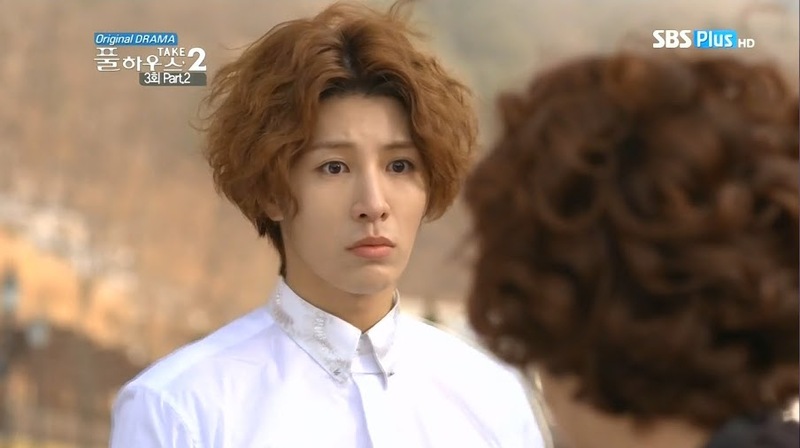 Tae Ik reaches up and is horrified to find the cucumbers still there. How did those get there? LOL. Man Ok tells him to lie down and this way he can’t blame her for ruining his pretty face. He has to look his best at the fan meet you know. Tae Ik says that he’s naturally this good looking. LOL. Man Ok once again yells at him to lie down. Man Ok has got the cucumber mask on him and is gathering her stuff to go. She tells him to make sure and wash it off after 15 minutes. When she receives no answer, she looks and Tae Ik is already fast asleep. She goes to wake him, but something stops her as she looks at his sleeping form. Instead, she sits back down. She says he’s really nice when he’s not talking. She compliments his long legs and nice looks and then makes a fist. Too bad he has a rotten personality. She then sits and waits to take the mask off for him. The next day Ra Gyung and Nora arrive at the fan meet with their press passes. They are stopped by security who double check their identities. When the man comes back out he replies that the magazine they reportedly work for went out of business ages ago. Hahaha. The man then says its been a headache with fans buying fake press cards. Where did they get the cards from? Ga Ryung laughs and takes Nora’s arm. She then tells her to get ready and they’ll run away. Well, that plan failed. The boys and Man Ok arrive at the meeting venue. Man Ok is impressed by all the stuff that the fans donated in the name of Take One. Tae Ik’s eyes gleam when he sees a big pile of rice. Excellent, they had just run out at home. 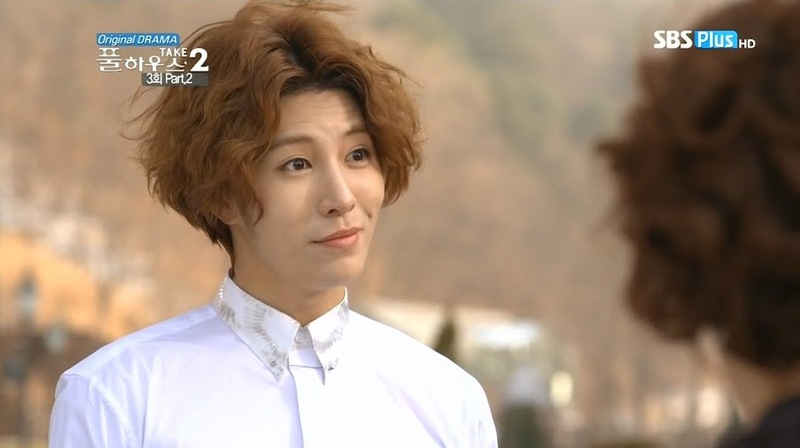 Kang Hwi doesn’t like this attitude of Tae Ik’s. So Tae Ik tells Go Dong to give everything to him. 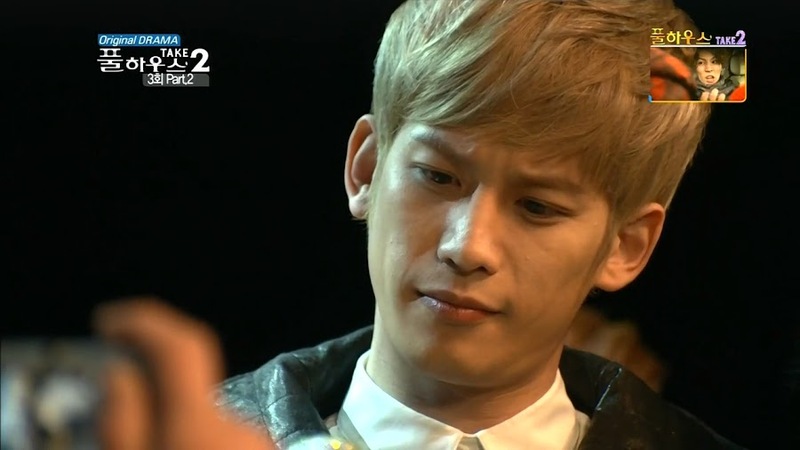 Kang Hwi negates this and says they will split everything equally—they have a weighing scale at home, right? 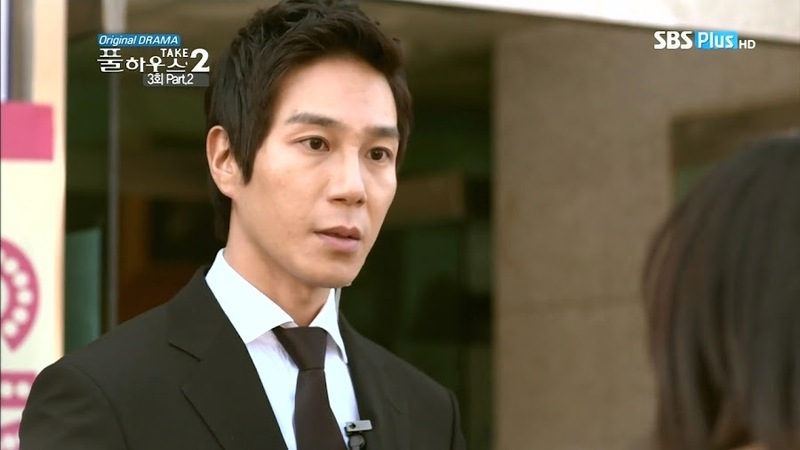 Kang Hwi then says that they should just donate it all so Jerk Tae Ik can’t have anything. Um…I know Tae Ik tries to keep up his image, but everything points to him not having any money left over, so shouldn’t Kang Hwi catch on and find out what kind of troubles his partner has? Tae Ik says he’ll definitely take it with him. Kang Hwi says that’s fine, but his half can be donated since he’s not a petty person. The boys start with a performance and Bum Soo compliments them on being cool and turns to Man Ok and says they are even more cool than normal thanks to her. She’s got talent. This makes Man Ok very happy. We then cut to a wardrobe change. 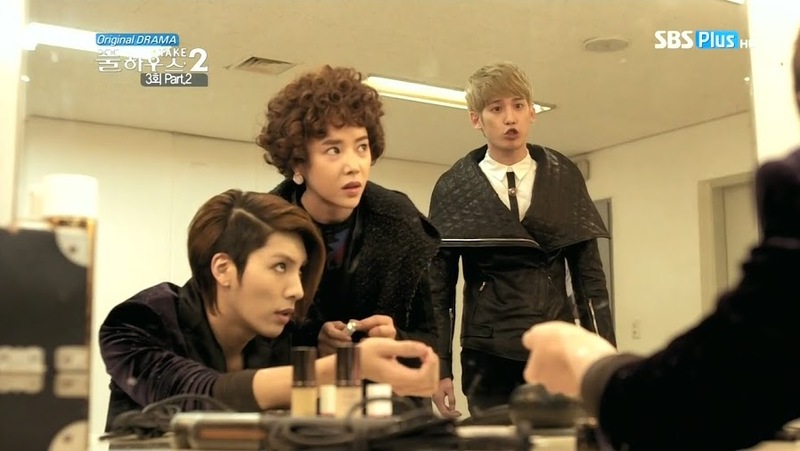 Tae Ik curls his lip at Man Ok’s and Kang Hwi’s display of friendliness. Bum Soo then comes in and says it’s time for the talk show portion. They go to leave and Man Ok checks them over once more before giving them the okay. 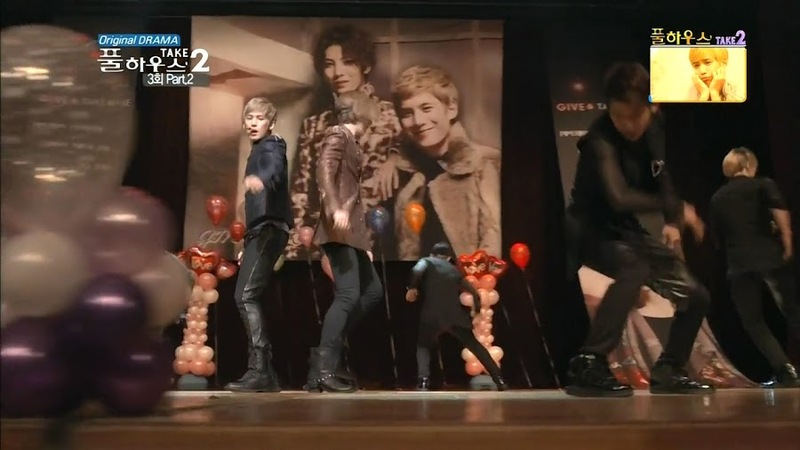 This portion of the fan meet has the boys accepting and opening presents from their fans. 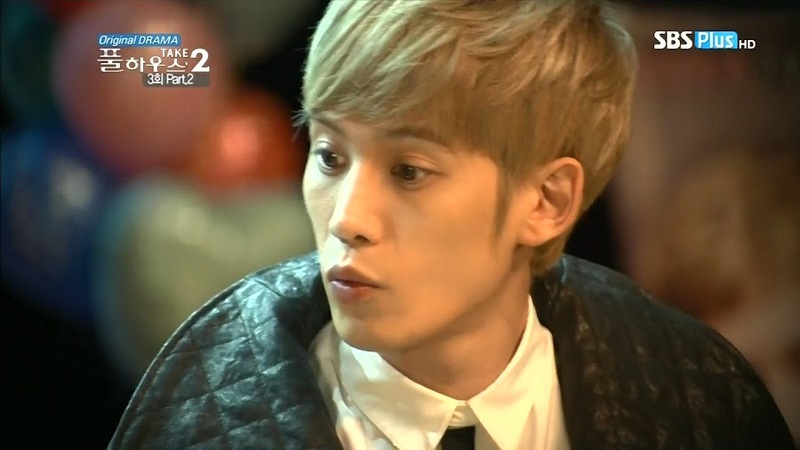 Tae Ik is disappointed when a jewel studded mic goes to Kang Hwi. When Kang Hwi goes to take a picture with the fan who brought it, his vision starts blurring. Uh-oh. Will he have some issues down the road? It’s now Tae Ik’s turn to open a heart shaped box with his name on it. 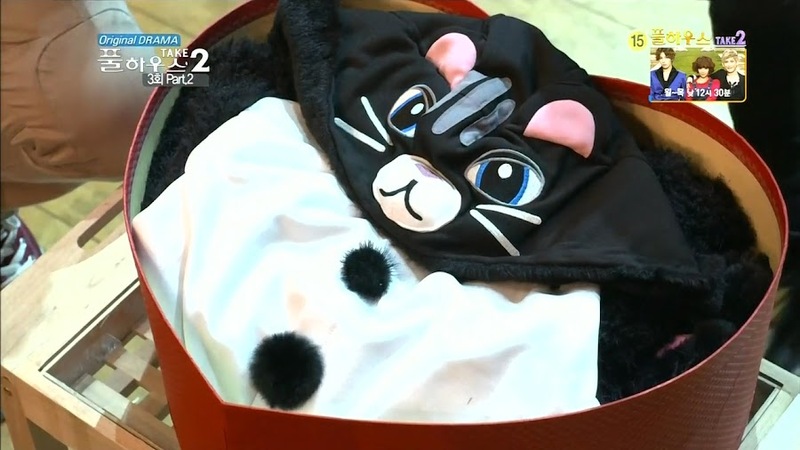 Tae Ik is definitely not happy when he opens the box and it’s a cat pajamas with fur. He immediately starts having an allergic reaction that he tries to cover up. The fan that made the unique gift wishes to see him wear it. Both Tae Ik and Man Ok kind of panic at this. Kang Hwi smiles and says Tae Ik will look really cute in it, won’t he? 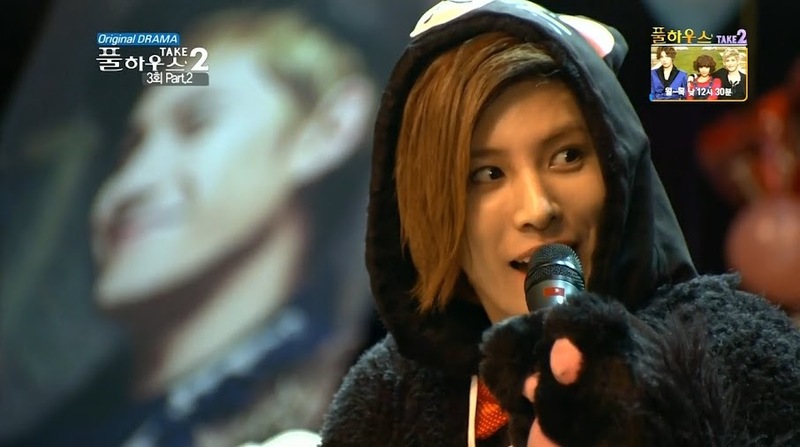 The fans scream and yell at Tae Ik to wear it. 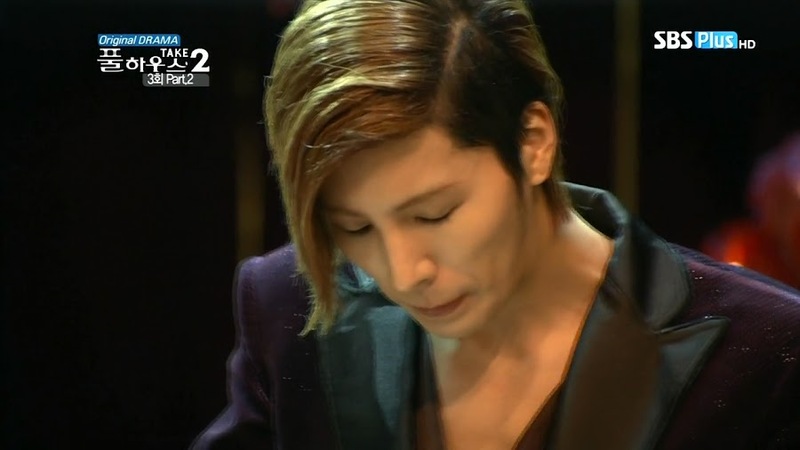 Kang Hwi then sticks his tongue out and Tae Ik. That was low. Tae Ik wears the outfit and takes a picture with his fan. Immediately afterward he’s sneezing and itching. 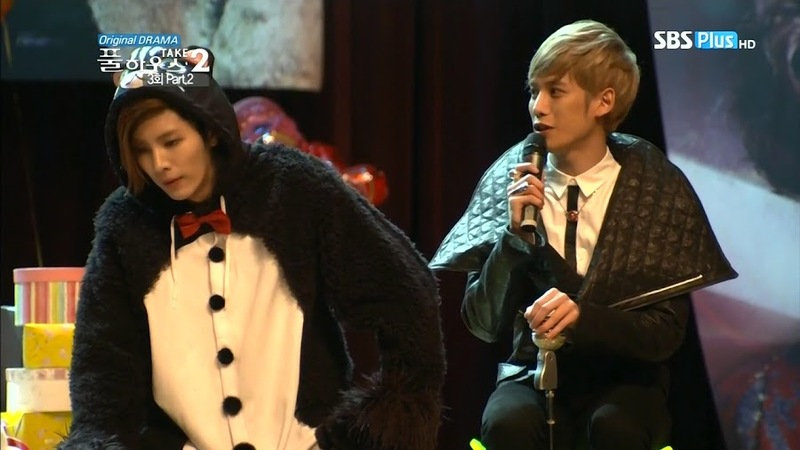 Kang Hwi then comes up and announces that Tae Ik has broke out and has a fur allergy. The fan is horrified and immediately apologetic as she didn’t know. She apologizes and Tae Ik tries to play it off as a joke. 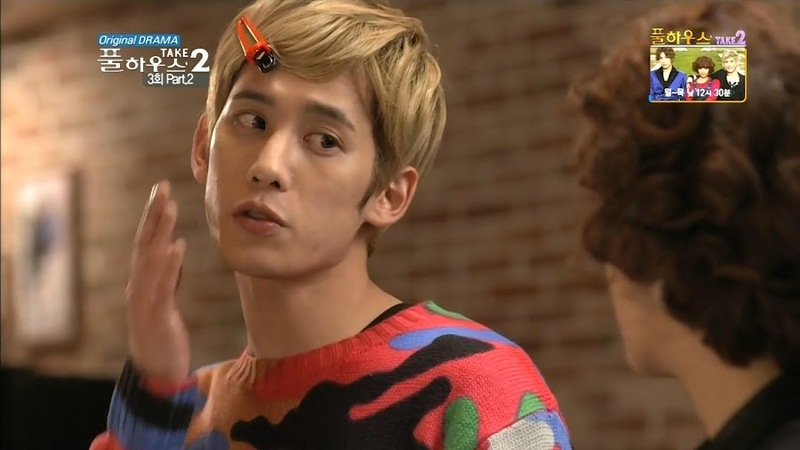 Since he did that, Kang Hwi decides to make him suffer some more by getting the fans to encourage him to keep wearing it. Meanwhile, Man Ok has run off to a pharmacy. The meeting continues with Tae Ik in the suit, obviously having a very difficult time. The MC talks over the rice wreath donations. 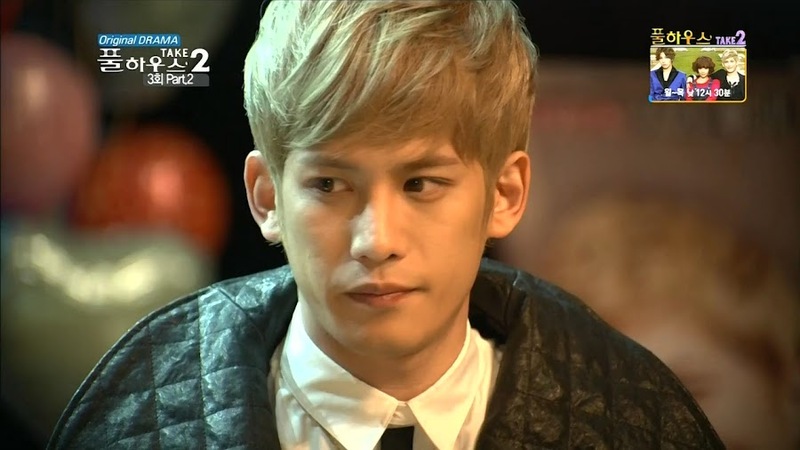 Kang Hwi says he’s very touched by the fans love and devotion to do such things. He then says he will be donating a portion of his own gifts. Only a portion. Tae Ik, not to be out done, says he will donate EVERYTHING. 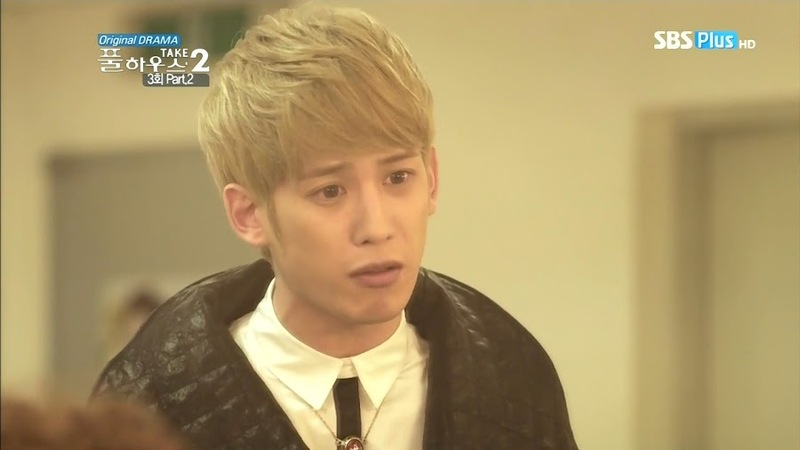 This really shocks Kang Hwi. 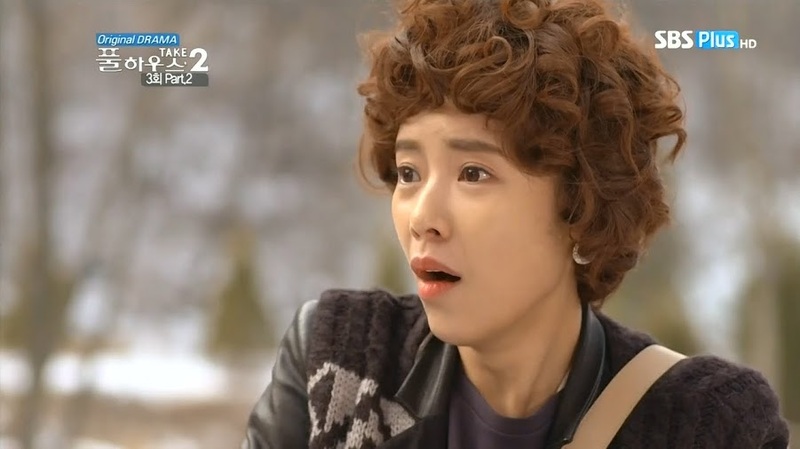 Looks like this is Tae Ik’s payback as she then says that Kang Hwi will be donating everything as well, right? The fans yell out that their oppas are cool. 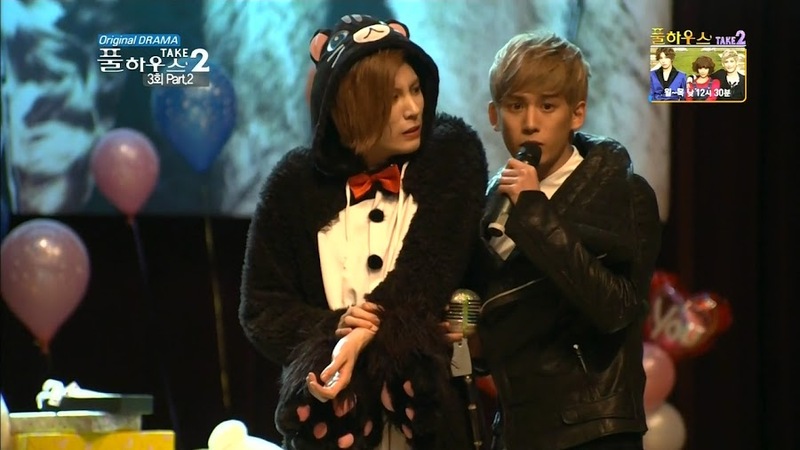 Kang Hwi tries to keep the precious mic, but Tae Ik ensures that gets donated, too. So in revenge, Kang Hwi makes sure that Tae Ik keeps the pajamas. Afterward, Man Ok is applying ointment on the suffering Tae Ik. She assures him it’s the normal ointment that he always uses. Tae Ik then wonders what he’ll do about Kang Hwi who then comes rushing in and says that Tae Ik donated everything out of jealousy, didn’t he? 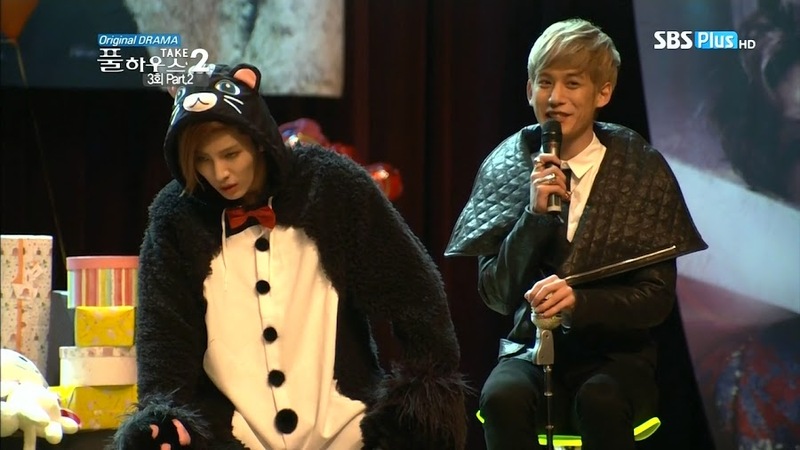 Tae Ik then says that it was Kang Hwi who started it by making him wear fur on purpose knowing full well that Tae Ik is allergic. Then starts the usual bickering match. Man Ok has enough and says she will record what they are doing and upload it on the internet if they don’t stop. The boys yells in unison that she cannot do that. Man Ok then tells them to fight later at home. She then asks for the watches. Tae Ik takes his off and angrily gives it to her while Kang Hwi tries to wheedle her into letting him wear the watch for one day. Man Ok says she can’t as they have to be returned that very day. Kang Hwi runs off and Man Ok puts down Tae Ik’s watch by the cat suit and runs after him. Yep. Definitely won’t be good. Bum soo has to leave and puts everything in Go Dong’s hands. The younger man says he has things covered and Bum Soo tells him to help out Man Ok since its her first time. Thus Go Bong should pack up the stuff and send them off first. Until the interview is over, Go Dong will also have to stand guard until its done. He goes into the room and no one is there. Then in come the staff for the donations. Go Dong points out which boxes to take and then packs up the cat suit and takes it with him. The watch is gone (probably stuck in the suit now). Man Ok returns with Kang Hwi’s watch talking about how he was acting like a kid. 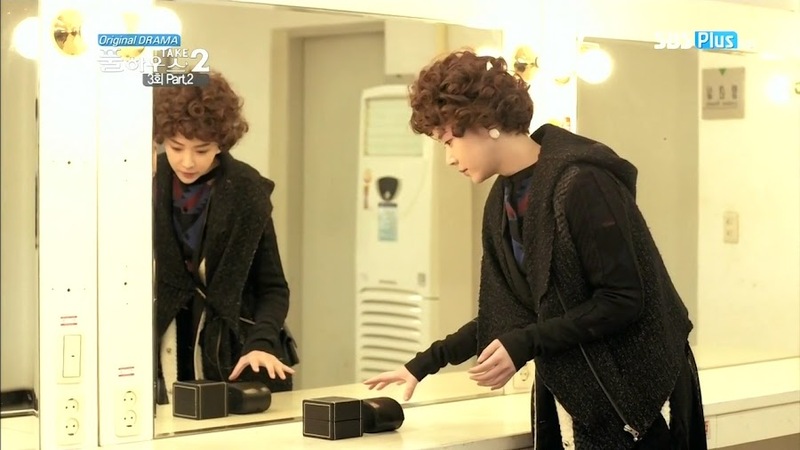 She puts it away and discovers that Tae Ik’s watch is now missing. Man Ok rushes after Go Dong and asks if he’s seen the one watch. Go Dong replies that he hasn’t and sends her after the men who took the donations. Man Ok rushes out, but they leave before she can get to them. Thus she chases after them on her scooter. When she gets to the donation place and they check over everything, but still no watch. The woman there tells Man Ok that it might have gotten mixed up with something else. Man Ok goes back, but the room is empty and had been cleaned. She then calls up Go Dong to ask where he put the clothes and props from the waiting room. Go Dong says he sent them on ahead. Did she find the watch? Man Ok replies still not yet. Man Ok then rushes to the boys house. 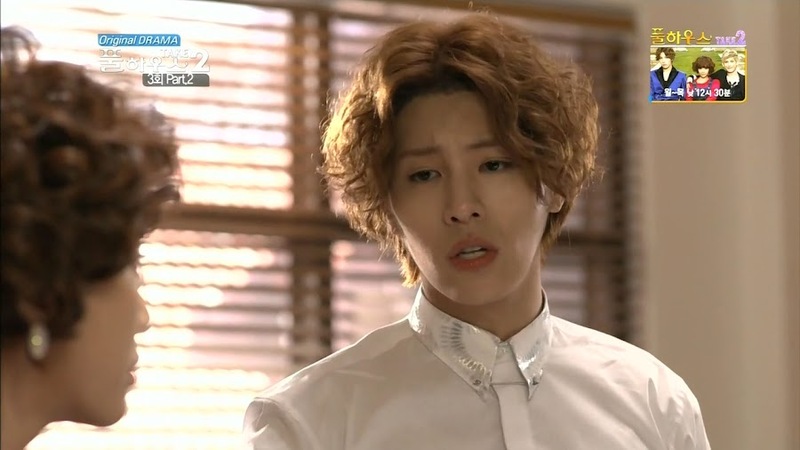 Kang Hwi is shocked to come home and find the lights on. Go Dong says its probably Man Ok. Kang Hwi happily rushes in while Go Dong becomes worried. She must not have found it yet. Tae Ik asks what’s going on. Meanwhile, the house is a disaster area with Man Ok sitting in despair after not having found the watch. Kang Hwi asks if she’s all right and Man Ok starts crying. No matter what, she can’t find it. Kang Hwi wishes to know what disappeared. Man Ok just keeps crying and wonders what she can do. 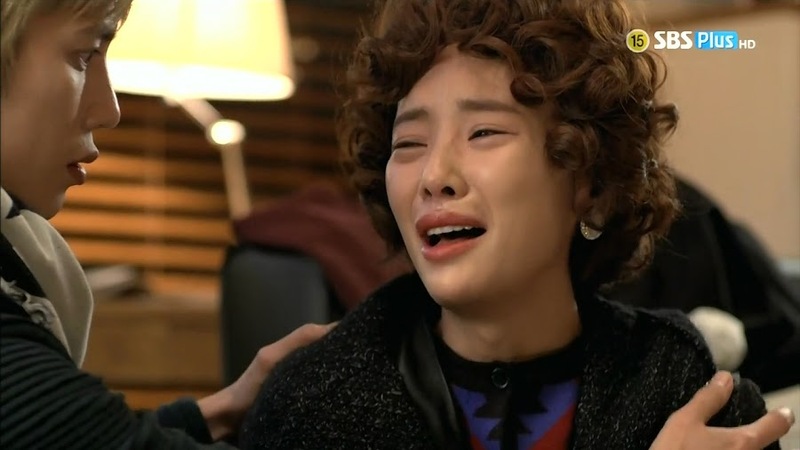 Kang Hwi hugs her and says it’s okay. Enter in an angry Tae Ik. The episode ends and you know when the watch is discovered in his cat suit, he’ll be blamed for trying to ruin her because that’s just how dramas play out. The innocent always get blamed for accidents or deeds that someone else did. Then again…Tae Ik’s attitude doesn’t necessarily help matters. You’re welcome 🙂 I’m hoping to get the screencaps up for it tonight.